These energy industry partnerships both offer double-digit yields. Which one is more likely to outperform? From the moment they get yanked out of the ground to the moment they go into your fuel tank or home furnace, oil and gas have a long and complex journey to make. While some companies both extract the stuff and ship it, the job of transporting and storing petroleum -- along with its various refined versions and by-products -- usually falls to pipeline and terminal operators like Buckeye Partners (NYSE:BPL) and NuStar Energy (NYSE:NS). As master limited partnerships (MLPs), the rules for Buckeye and NuStar are a bit different than for ordinary stocks. Among other requirements, they must pay out the vast majority of their cash flow as distributions. That means high yields for investors, but these two MLPs' yields are high even by MLP standards, which could be a warning sign. Let's dig deeper to see which is the better buy. Pipeline master limited partnerships can pay top yields, but a yield that's too high may lead to underperformance. Image source: Getty Images. Buckeye is about twice as large as NuStar by revenue and market cap, but it has more terminal capacity and less pipeline capacity than its smaller competitor. But "competitor" may be the wrong word, considering Buckeye and NuStar operate in different areas of the country. Both companies handle crude oil and refined petroleum products; Buckeye also transports natural gas liquids while NuStar owns some ammonia pipelines. However, Buckeye's pipeline network is primarily in a northeastern/north-eastern Midwest corridor running from New York and New Jersey, across Pennsylvania and Ohio to Chicago, Iowa, and Missouri. Its terminals, on the other hand, are scattered across the U.S., with some in the Caribbean and even one in Singapore. Meanwhile, NuStar primarily operates in a narrow north-south corridor running from North Dakota to Texas and Louisiana, with some lines running into Colorado and New Mexico. Aside from a small handful of mid-Atlantic terminals, its terminals are largely distributed along its pipeline route. Honestly, these two companies might want to consider joining forces through a merger or acquisition; their routes are adjacent to one another but hardly overlap at all. While their operations may have some differences, one similarity between Buckeye and NuStar is their high levels of debt. Energy infrastructure is a capital-intensive business, and many companies need to take on large amounts of debt to pay for pipelines and terminals that -- of course -- can't generate revenue until they're fully completed. Even in this industry, though, debt levels can get too high. For many companies, a debt ratio of four to 4.5 times EBITDA is considered the upper threshold for maintaining an investment-grade rating on their debt. Because each company is unique, though, it's not an exact science, which is why the ratings agencies like Moody's and Fitch Ratings might give one company an investment-grade rating while downgrading another to junk status for the same amount of debt. BPL Financial Debt to EBITDA (TTM) data by YCharts. Buckeye is at 5.0 times EBITDA, while NuStar is at 5.7 times. However, both companies have been advertising lower numbers. Buckeye touts that its debt is at 4.3 times adjusted EBITDA, while NuStar uses a figure of consolidated debt as 4.7 times consolidated EBITDA. In any case, the ratings agencies have given the larger Buckeye a Baa3/BBB- rating -- the lowest possible investment-grade rating -- while assigning NuStar a junk rating of Ba2/BB. The big question for these companies is whether their debt loads -- and, in NuStar's case, its low rating -- will be problematic for investors. Because the hefty distribution yields of MLPs are their major selling point for investors, an MLP's ability to fully fund its distribution is a major consideration -- if not the major consideration -- when shopping around for an MLP in which to invest. When an MLP can't cover its distribution with cash from its operations, it has to make up the difference with debt. But as we've discussed, both Buckeye and NuStar are already heavily indebted. That could put their distributions in jeopardy: If they can't fund their distributions through debt or raise the money in some other way, like selling assets or issuing more equity, those distributions will have to be cut. That's what happened to NuStar in Q1 2018. Rather than take on additional debt at a hefty cost, it lowered its distribution, which had crept up to a more-than-20% yield. The effect was almost immediate: in Q2, CEO Brad Barron reported that he expects the company's 2018 coverage ratio to be 1.2 times to 1.3 times. That's a sizable cushion and should give NuStar room to continue paying its distribution at current levels without taking on further debt. Buckeye, meanwhile, isn't in as good of shape when it comes to distribution coverage. In Q2 2018, the company's coverage ratio was an underwater 0.87 times. But CEO Clark Smith has been very clear that he regards maintaining the company's investment-grade credit rating as paramount. On the company's most recent earnings call, his comments indicated that if it came to a choice between maintaining the company's debt rating or cutting the distribution, the distribution would likely go first. This situation means that -- at least currently -- NuStar's yield seems safer than Buckeye's. Given the risk of an imminent distribution cut at Buckeye, NuStar is the better buy right now. It looks as though it will be able to fund its distribution at current levels for the foreseeable future, while Buckeye's prospects look much more iffy. 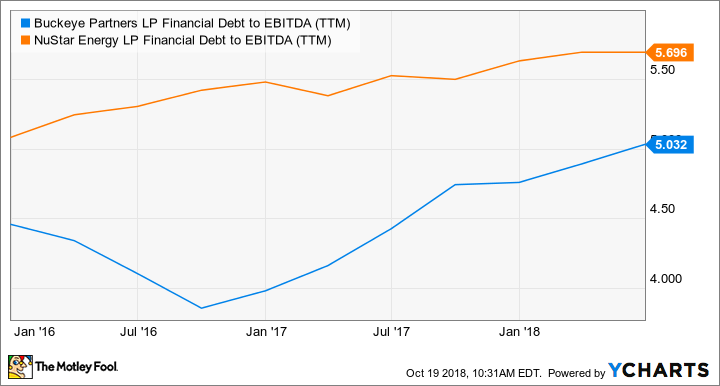 However, both of these MLPs have high levels of balance sheet debt compared to their peers, and neither one is what I'd call a top prospect in the space. There are much more attractive places for your money within this sector.